Are you tired of plugging and unplugging cables in the never-ending effort to keep all of your USB devices charged? We have just the charger for you: the titanic 10-port mains charger from Aukey. As well as allowing for simultaneous charging of a whole family’s worth of devices, it also comes with Qualcomm Quick Charge 3.0 on two ports, allowing for extremely rapid charging of supported smartphones. It’s a promising feature set, so let’s see it shakes out in real world use! 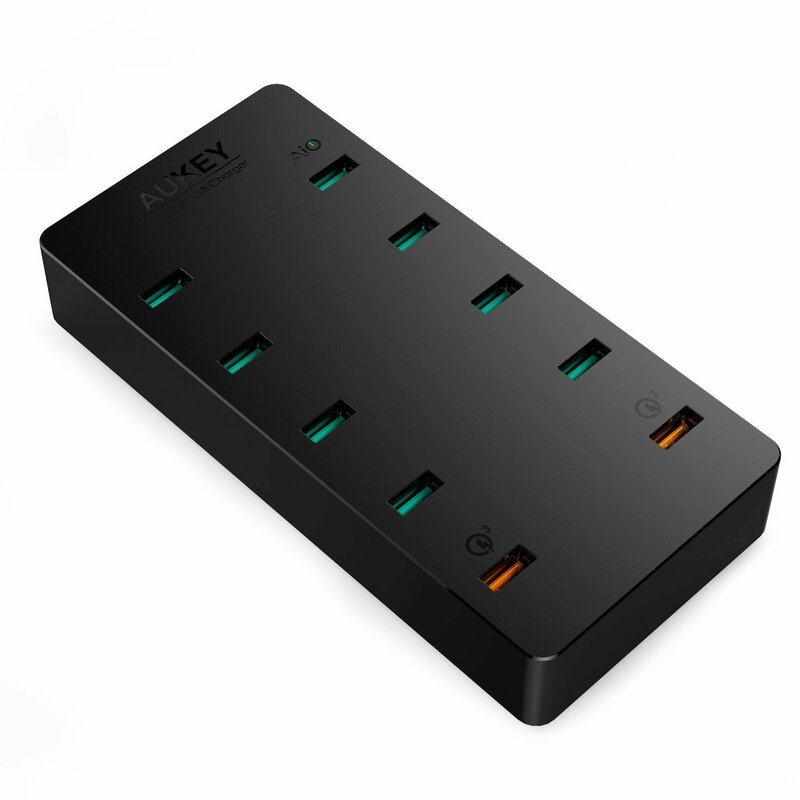 The Aukey 10-port charger is straightforward in its design; it’s a black plastic box with gently rounded corners. On the top, there are two rows of five USB ports each; eight of these ports are coloured green, two are orange — the former are the normal ports, which supply up to 2.4A, while the latter are the Quick Charge ports. The front face of the box has a figure-of-eight mains input and an on/off switch. The underside has four rubbery feet to keep the box from slipping out of position. The charger comes with one Micro USB cable and a plastic cable clip which allows you to bundle multiple cables together. We tested the Aukey charger in the most obvious way we could think of: we connected 10 USB devices at once and watched cautiously from a distance. Happily, the charging hub worked as described, providing rapid charging to each device that was plugged in. A Galaxy S7 Edge smartphone charged from 0 to 100% in a little over an hour and a half; the same time as it takes using a Samsung fast-charge mains adapter. We found that the charger was generally well designed, with plenty of space between each port to allow even bulky cables to be connected easily. The charger was thoughtfully supplied with ten rubber stoppers, which kept dust out of unused ports. The easily accessible power switch was also appreciated, as it was easy to turn off the hub when it wasn’t in use. Likewise, the cable clip made the tangle of wires a little tidier. If you need to charge a large number of USB devices on a regular basis, then Aukey’s 10-port charger could be just what you need. The addition of Quick Charge ports makes it a great choice for smartphone owners, and you’ll see substantially faster charging times as a result. It’s great to be able to just leave in a cable to charge every device, and not need to worry about swapping cables between a limited numbers of ports. Similarly, you can also use this well on holiday, as you can charge smartphones and other USB devices for a whole group using a single travel adapter — awesome. Roccat Horde Aimo review: totally membranical, dude!